Every building has its own harmonic language; resonant frequencies are frequencies whose wavelengths directly match the size and shape of a given acoustic space. They energetically reinforce themselves and perceived as significantly louder than a non-resonant frequency. 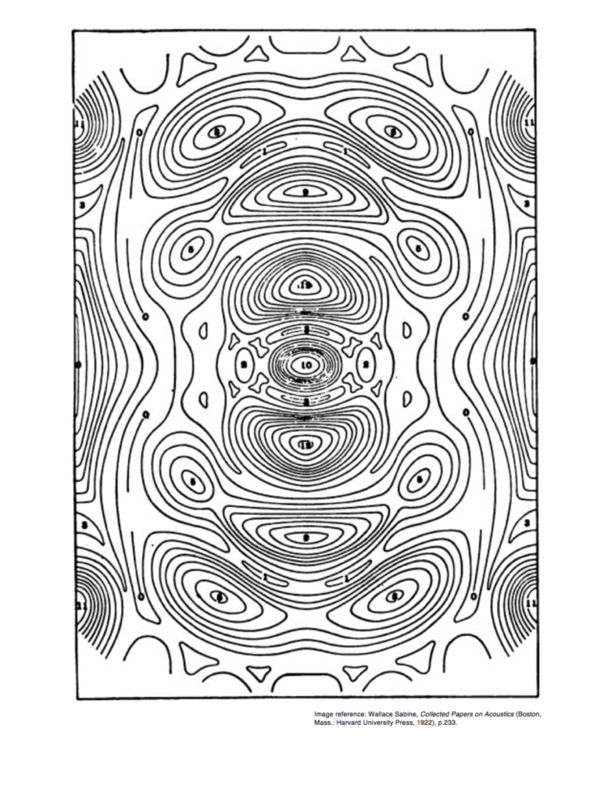 When resonant frequencies are played into a space, they create interference patterns or, a topology of areas of high and low sound pressure -resonant topologies. 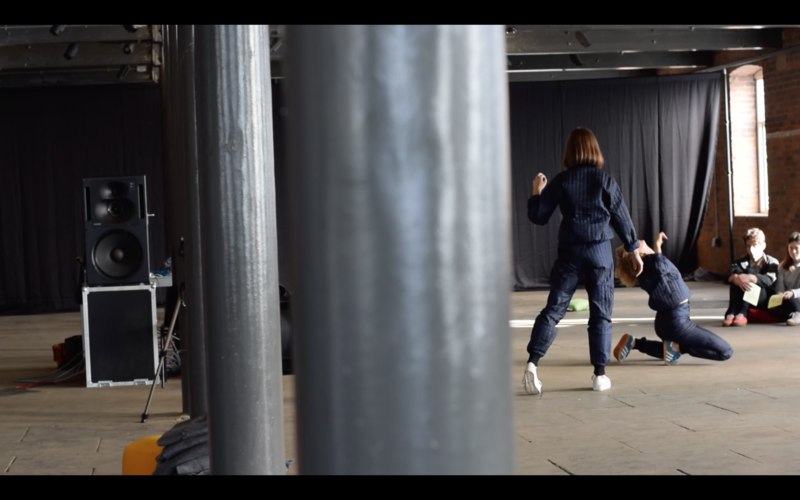 In this piece, dancers Hannah Buckely and Torah Hed improvise around these topologies, creating choreographies in direct response to them. Every movement corresponds to the physical distribution of sound in the space, which is a direct product of the architecture. 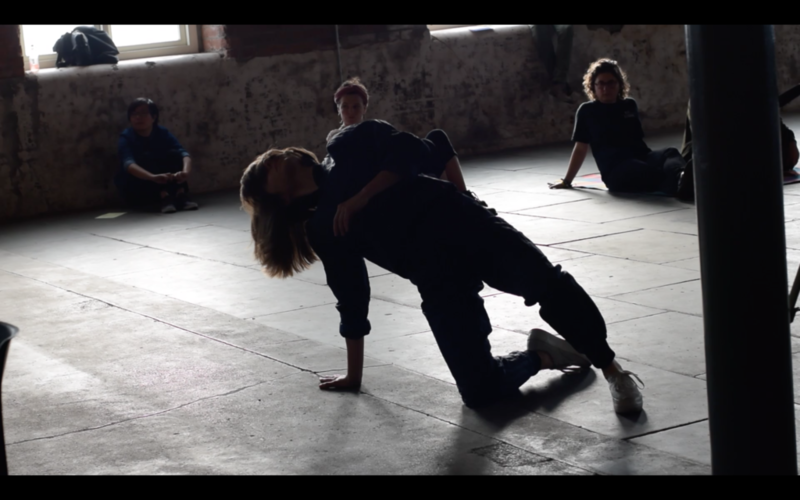 The dancers’ improvisations, then, are a direct response to the architecture which is gained only through listening. The Calder was acoustically measured and its resonant frequencies are played back into it in varying combinations to create an evolving topology. In the first section the dancers have their eyes closed, maintaining focus on their individual perceptions of the space. 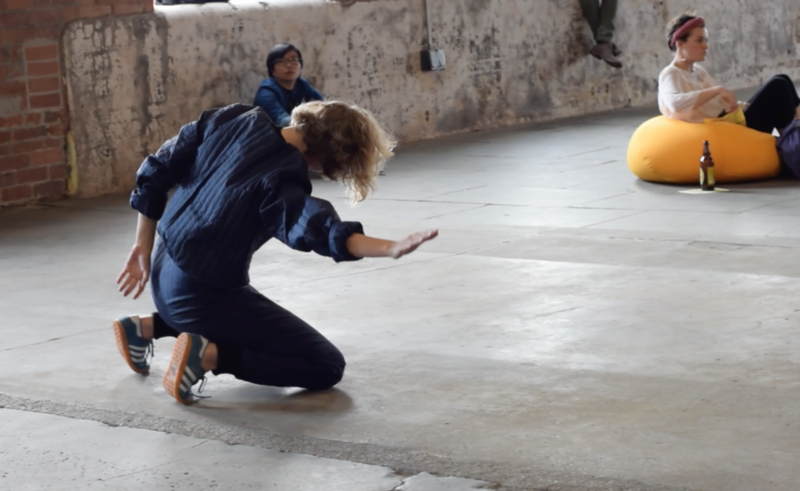 In the second, the dancers open their eyes and place their focus on each other: individual processes of listening become negotiations which are expressed through shared patterns of movement. 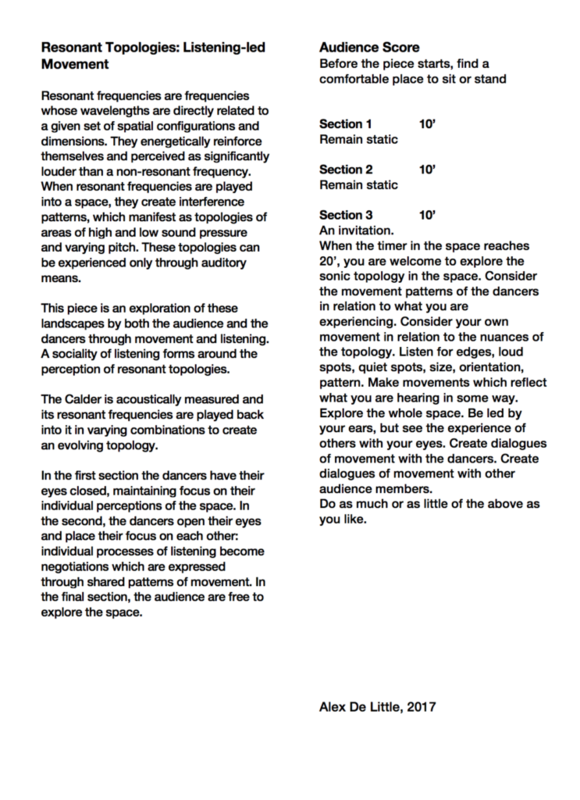 In the final section, the audience are free to explore the space. The audio in the video is recorded with binaural microphones to give an idea of how the sound changes in the space with movement. The recordist was slowly moving around the space as the piece was unfolding. Hannah Buckley: I don’t think it really needs a structure. You can just use the sound. Tora Hed: Also, it’s something about coming with repetition of movements; repetition of the shape that I was doing. Almost like a trance. Alex De Little: The only thing that I can think of which is comparable is reacting to an actual building, for example stepping through a threshold or around a corner. Architecture as a prompt for movement. [..] I think that everything in this piece should come out of what you’re hearing. TH: Isn’t it something with a rhythm, because sometime I feel it’s quite not some much rhythm in the sounds, but when I do this [moves head back and forth], there is a rhythm, right? It’s like, sound, sound, sound, sound. So It could also be that the body is trying to find rhythm. HB: My ears are not trained at all. I am not a musical person. I don’t listen to music in a musical way. So I feel like I miss a lot of things. ADL: I spend my whole time listening to this, so if I were to come up with a piece it would be based on my own observations. You two read something totally different into what’s going on which is way more interesting. Even between the two of you, you read different things into it. HB: Today obviously this is the first time that we’ve done it so we have been quite deeply in our own investigations, but then there was a point where I could imagine also trying to build in the relation- like having more awareness of each other and the impact of that on the sound. There was a point where I was like, ‘I’m going to go and stand behind Tora and see if it makes any difference’. TH: Yeah I really felt I wanted to do that, I was really seeking for bodies at some points. HB: The relationship between whoever’s in the space is an interesting aspect of this. HB: Well it happens naturally if you put more than one body in the space, like when I was here and you were there and we were kind of doing similar [moves]… these things; it begins to happen anyway. TH: I think it’s because this is how we’re trained to think about the space and relationships between each other […] when you were moving from one point to another I felt a need to move to a different place or change because something happened in the space and I felt that changing my way of moving in the space. It becomes an affection of movement. ADL: I think what’s cool that’s coming out of this is that rather than the rules that I made up, this should be about where your awareness is. So if your awareness is on yourself then you come up with your own things. The main rule is that everything you do has to relate to something sonic- it’s coming out of that. Perhaps to start with it’s more directly related and as the piece goes on, it becomes more abstract, more about feeling. So there are bits where you are just aware of yourself, but there are bits where you become aware of each other and it becomes a collective awareness, even if you’re not necessarily doing the same things. But that collective awareness then directs how you respond. HB: Yeah, I mean I think it’ll be interesting to keep doing it and see how it grows. ADL: Yeah, I mean I think that this is exactly how it should be -coming out of doing rather than thinking. HB: Yeah exactly, because the sounds are so powerful. They do actually drive movement- even if you weren’t dancing you’d still want to move because they have a physical effect on you. They shift when you move, so even if you were only asking the audience to move around, I think it would have a physical impact. It’s unavoidable- you can’t avoid the sound. ADL: In the first year of my PhD, two years ago I made a piece using the same concept as this, but the only thing that interested me was how the audience responded. The music didn’t particularly interest me. And that is the site of where things are happening; that moment when you’re being led by sound. HB: Yeah, and I think also where the audience are [situated] is really important in this. I could imagine them just walking around without necessarily having to be stationary. TH: There’ something very intriguing for me as a performer to have people around, and also then I can’t really come back to the sound as the same because then there will be interruptions. It would be a next step right?